A bicycle is the smallest vehicle on the road. It is important for cyclists to be visible, ride predictably, understand how traffic works and to communicate with other road users. Cyclists can also learn how best to protect against theft and the process involved in recovering a stolen bicycle. Streetcar and railway tracks can be dangerous. Crossing at the wrong angle, you can catch your wheel and fall. Always cross tracks at right angles, even when passing slots or cracks in the pavement or sewer grates. Your lane position to cross streetcar tracks at a right angle will depend on the angle of the tracks and the grade of the road. Shoulder check and signal your intentions to road users behind you. When crossing streetcar tracks, slow down. Stop pedaling, put your cranks in a position horizontal to the ground and shift your weight from sitting on your saddle so that you are using your arms and legs to balance. You will be able to absorb the bump by using your arms and legs instead of bouncing on your seat. 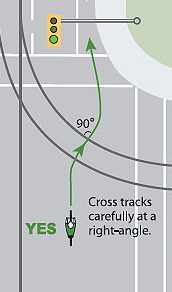 If you are not comfortable riding over the tracks, either because there are multiple tracks at an intersection, difficult track angles, or because of traffic, pull over to the curb, dismount and cross the intersection as a pedestrian. 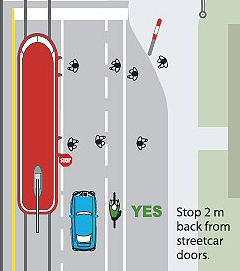 By law, you must pass streetcars on the right. When they stop to pick up or let off passengers, you must stop two metres behind the rear door until all passengers have boarded and disembarked on the sidewalk. When TTC passengers are getting off the streetcar, wait for them to cross to the sidewalk before passing. Cyclists aged 14 years and older may not lawfully cycle on Toronto’s sidewalks. You may be fined $60 for cycling on a sidewalk. If you are cycling recklessly or negligently, the fine may be increased to $90. Cyclists should wear clothing that will not catch in the wheels, chain or other moving parts of the bicycle. Wear comfortable, layered clothing that breathes, yet is wind resistant. Wear an approved helmet for safety. Choose a helmet that fits correctly and look for a CSA, Snell, ANSI, ASTM British Standard or Australian Standard sticker that shows that the helmet meets legislated standards. According to the Highway Traffic Act 104, cyclists 17 years of age and younger must wear an approved helmet or risk getting a $75 fine. To make cyclists visible to motorists at night, wear light-coloured clothing or reflective fabric that glows in the dark. Cyclists must use bicycle lights from a half-hour before sunset to a half-hour after sunrise. Use a white front light and a rear red light or reflector. Under the Highway Traffic Act 62, there is a $30 fine for improper bicycle lighting. To protect against sun burn and melanoma, remember to wear sunscreen when riding in the summer months, even on cloudy days. Sunscreen should have a SPF of 15 or higher and be waterproof. Ride with a water bottle at all times to avoid dehydration, especially during hot and humid weather. Plastic water bottles easily clip onto the frame of the bicycle. It is recommended that you drink one bottle of water every 20 minutes. To maintain good balance, do not carry objects on the handlebars. Wear riding gloves made of leather or fabric to protect your hands and to provide a good grip for brakes. When cycling in the rain, increase stopping distance and wear flourescent clothing to make up for the decreased visibility. Do not ride through puddles, which may hide pot holes, glass or other road hazards. It is also a good idea to stay away from the center of the road where oil slicks form. Lock your bicycle frame (both wheels if possible) to an immovable object with two points of contact, which cannot be easily cut or broken. Use a quality lock (a hardened steel U-lock or steel chain and padlock). Consider using two different types of locks; thieves are less likely to carry two kinds of tools to break both locks. Padlocks should not hang low enough to be smashed against the ground with a hammer. Never leave accessories, like lights and bags unattended with your bicycle. Ontario’s mandatory bike helmet law requires all cyclists under 18 who are riding or operating a bicycle to be wearing an approved bike helmet. Parents are liable to be fined $75 for not ensuring their children under 16 are wearing a helmet; 16 and 17 year olds can be fined directly. Teach children to obey the rules and always wear a helmet. Practice riding in a safe, controlled environment. Children learn to balance and handle a bike many years before they are able to develop a sound judgment about traffic and a realistic appreciation of risk. Children 9 and under should be supervised by an adult when they cycle. Never carry a baby in a front chest carrier or in a backpack. If you want to cycle with your infant, the only safe option is in a car seat strapped into a bicycle trailer, but it is best to wait until your child is able to sit up alone. Never cycle with an infant without an infant’s bicycle helmet on. If the child is screaming too much, don’t be tempted to cycle. Try again when the child is older. The earliest cyclists should begin riding with their children is when the they are around 12-16 months old and can support the weight of their head while wearing a helmet. Using a trailer or a rear bike seat depends on your riding circumstances, ability and personal preference. A trailer tends to be more stable, and allows more room for toys and snacks, but the child is further away from you and low to the ground. Trailers are not suitable in high auto traffic situations: it is hard to hear, the child is not very visible, and the fumes are blowing into their face. It is best if another adult can ride behind the trailer. Bike seats mean your child is close to you, but the centre of gravity shifts higher and further back, making your bike unstable. Practice with a twenty-five pound bag of potatoes before you strap your child into the seat. A novice or inexperienced adult cyclist should avoid adding a bike seat. Remember to always strap in your child and ensure both of you are wearing a helmet. Teach your child to learn how to ride a bike in a park or around the block. If you want to go further, try a trailer bike. It attaches to your seat post and your child sits on the extension, holding the handlebars and pedaling. This device allows you to cycle with your children if they do not have the stamina to go long distances. Sidewalks may appear safe, but have hazards, such as cars backing out of or pulling into driveways, obstacles, uneven pavement and pedestrians. Teach children the basics of the rules of the road, even when cycling on a trail: riders should stay on the right, ride in a straight line, be courteous with other users and communicate. Cyclists need to know what is going on around them. Anticipate what will happen down the road. Cyclists are safest when other road users can see them. Use reflectors and front and rear lights. Choosing the correct road position will help to be part of the flow of traffic, which increases visibility. Cyclists are predictable when they ride in a straight line and when they communicate (signal) their intentions about changing position or direction. By riding in a straight line, it is easier for traffic around you to predict your actions. Ride 1 meter away from the curb, never in the gutter, and out of the way of opening doors along parked cars. Check behind yourself frequently, especially before changing position on the road. This ensures that you know what is happening around you. Communicate your intentions to other road users with hand signals. Don’t signal without looking behind first – it may be unsafe. By making eye contact, using your bell or voice you can negotiate your way through traffic in cooperation with other road users. At traffic lights, it is not safe to overtake (on the right), so either wait your turn or consider overtaking (on the left) to advance before pulling in to the flow of traffic when it starts moving. Never cycle in the driver’s “blind spot;” they won’t be able to see you if they decide to turn. Always maintain enough distance behind or in front of any large vehicle so the driver can see you. If you can’t see their eyes, the driver probably can’t see you. Cycling on the sidewalk is against the law for adults. If you are nervous about cycling on the road, get training, or talk to a more experienced cyclist about safety and route planning. Ride with a more experienced cyclist until you get the hang of things. Carry either a lighter, WD40, or light machine oil, in case your lock freezes; try adding a drop of oil or graphite lock lubricant in the locking mechanism to prevent freezing. Adjust your fenders, if necessary, so that there is lots of room between the fender and tire to avoid snow build up. Clips are not recommended in snowy or icy conditions; you may have to put your feet down in a hurry. Lessen tire pressure to the low end of recommended range (written on tire sidewall) to increase traction. Cyclists are divided in their opinions about what tires work best. Thick-tread mountain bike tires will increase traction/grip on snow (particularly good for hard packed), whereas thin tires will cut through the snow (particularly good for loose snow) to the pavement. Some people use studded tires; these are noisy on dry pavement but particularly good for ice. Snow banks may cause you to ride further out in a lane. If you need to move out from the curb be sure to communicate your intentions with other traffic. Shoulder check to make sure it’s safe to move out, signal, do a second shoulder check to make sure it’s still clear and then move out. Place your bicycle outside before riding – less snow will stick to it if it’s already cold. If you encounter black ice, steer straight, don’t pedal, and try not to brake as this could cause you to skid and fall. Avoid riding over snow – it may hide ice. Avoid riding over snow banks; stay on wet pavement. Leave extra room for braking and shift often to prevent snow from jamming up the chain. Streetcar tracks will be icy when other road surfaces are not. Always cross at a right angle, stop pedaling, keep your pedals horizontal, flex your arms and legs to absorb the shock and lift off your feet. Plan your route in advance and have an alternative in mind in case of snow or ice.